Our treatment is a 50g tin of concentrated ointment with several properties (listed below) that assist in the healing process. Each tin will last approximately three months. Prices start at $24.95 USD per tin and decrease as you purchase more. What makes the treatment so effective? Our treatment has a moisturising property that helps to sooth the skin lesion and prevents further drying. This is very important, particularly for severe chilblains where the skin is cracked and/or blistering. When applied to the skin, the treatment has a heating effect similar to that of Methyl Salicylate. This warms the affected area and increases blood flow. Restricted blood vessels is the primary cause of chilblains and increasing blood flow greatly assists the healing process. The treatment contains several natural antibacterial agents that clean the chilblains of bacteria. This assists in the healing process and also reduces inflammation. 1 After your first application, you will notice some relief within 24 hours. 2 Reduced swelling and itchiness starting to subside. 3 Swelling and itchiness significantly reduced. 4-6 Pain, itchiness and swelling almost gone. For chilblains affecting the toes, wearing shoes starts to feel comfortable. 7-10 Chilblains mostly non-existant. 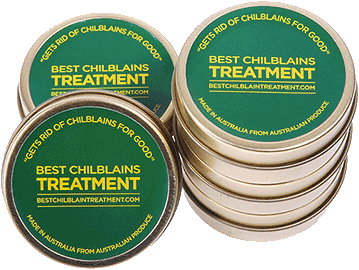 Continue the use of The Best Chilblains Treatment for a further 2-3 days for the best results. 1-2 You will begin to notice some relief. The moisturising properties of the treatment start to sooth the wound. 3-4 Wound starting to heal. Swelling and itchiness beginning to subside. 5-6 Swelling and itchiness significantly reduced. 6-10 Wound healing nicely. Irritation significantly less. 10+ Chilblains almost non-existent. Pain completely gone. Your experience using the Chilblains.org Treatment may differ slightly from these typical scenarios. Some stubborn chilblains may require longer or consistent treatment. Always remember to consult a medical professional if symptoms persist.